I got a new crop of mini nine patches done, BLUE. I need half the blocks to be a colour around and half need to be white on the out edge. I want the blues used in this quilt to be a little bit on the light or turquoise side and not too dark. These blocks finish to 3 1/2", so yes they are small. Here is 59 blocks done. I think this is now half all of the blocks done. I think I had about 60 done before I did blue. 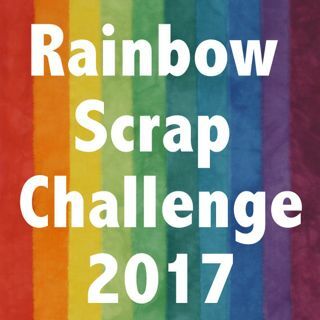 I have added this post to Soscrappy and the Rainbow Scrap Challenge . More little mini nine center parts. I picked Saskatoons today and added Rhubarb to make a fruit pudding. We are about to dig in and eat some. Your mini nines are adorable. I love the colours you chose. Your berry pudding looks delicious. I love those nine patches. So love Saskatoons- my sister has some rows of them on the property where she lives so she has been picking them like crazy.. My gran had them on her farm and I think of her every time I hear about Saskatoons.. Bet it was delicious fruit pudding..
Ooh, your mini nines are fabulous!